The Republican National Convention kicked off last night with speeches, drama and, most importantly, dancing. The official start of the convention is traditionally pretty boring. It includes rules procedures involving the different state delegates ruling yes or no on motions. It was not so boring this year. Without even mentioning the cute matching outfits some states had, Republicans were getting down to the music from the band and the atmosphere of freedom. 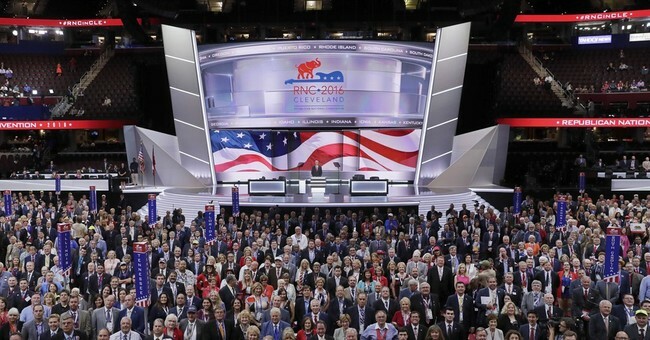 Here are some of the Republicans who had a way better time than anyone else at the RNC last night. 1. Let's start with this guy who was so hyped. Goals: To be on his level. 2. I think we can all relate to this woman in pink. 4. Friends who dance at the RNC together stay together right? 5. This man's smile is almost as big as the hat on his head. Love it. 6. In the land of opportunity one must seize every chance to show off some wicked dance moves. 7. Super casual lady is back and she is less casual. You go girl. 8. Meanwhile, Texas is showing everyone up. 9. Now this is all kinds of adorable. 10. Well, we know why it's called the Republican PARTY now. I think it's safe to say the Grand Old Party had a grand old time last night - and it was only night one.